A novel poly(β-cyclodextrin)/bentonite composite (β-CD/BNC) was successfully prepared through graft polymerisation by using ammonium persulphate–sodium bisulphate as initiators, and characterized by FT-IR and EDS. The equilibrium data fit Freundlich isotherm satisfactorily. Adsorption kinetic was fitted with pseudo-second-order. 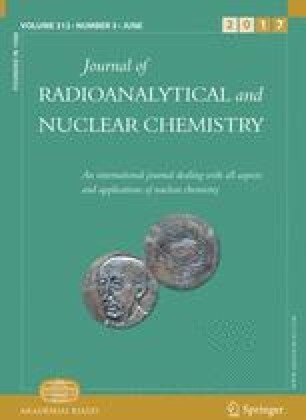 The maximum adsorption capacities for Cs+ by β-CD/BNC in absence and presence of Na+ and Mg2+ were 48.83 ± 0.35, 47.30 ± 0.28, and 42.52 ± 0.85 mg g−1, respectively. Adsorption of Cs+ was suppressed by presence of Mg2+ more than Na+. β-CD/BNC had a higher affinity to Cs+ than Na+ and Mg2+. β-CD/BNC was an effective sorbent for the treatment cesium waste water. This work was supported by the Doctoral Fund of High Education Program (Grant No. 20134324110003), the National Natural Science Foundation of China (Grant No. 11475080), the General Program of the Hunan Provincial Education Department (Grant No. 15C1178), the Graduate Student Research Innovation Project of Hunan Province (CX2016B427).